Today was a delicious day! Just perfect for moving pots around and getting the fountain running, planting some, digging some and simply just being in the present. 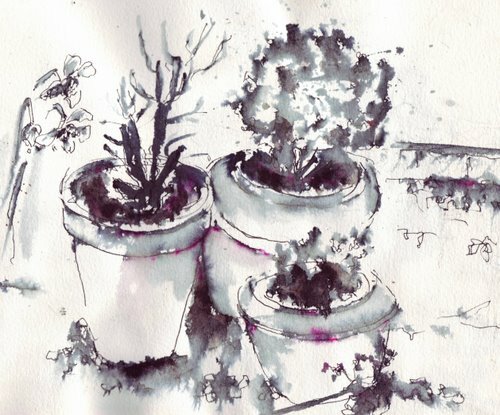 A few sketches done after digging and dressing the garden. All sketches done in sketchbook 19x25cm, rotring artist pen, red pilot pen and wash.
Genade Ronell! Na al die harde werk in die tuin het jy nog sowaar krag om te skets. !..Mooi mooi mooi!! Hou veral van die een met drie potte. Love the delicately splodgey, feathery effects you got here, Ronell. Sounds like a wonderful day – relaxing and energizing all at once. So happy to hear spring is in your neighborhood and your yard. Love those sketches. FABULOUS!! I so love the happy look of these, Ronnel!! They just compliment a pefect day!!! BRAVA! Isn’t it WONDERFUL to be in the garden! I REALLY enjoy the “here and now-ness” of these drawings– and I just adore the way you work–you’re such a good influence for me. I can’t wait to see your drawings of what’s growing. Glad to hear spring has arrived in France. The little touch of color is lovely on these sketches. This might surprise some, but I don’t do garden. I have never enjoyed it and am thankful the gardeners keep it looking trim. But I love visiting beautiful gardens and am envious of those who find such joy in their gardens. I can tell by the sketches here that you must loose yourself in your garden. How I would love someday to sit there with you, eating something yummy with sketchbooks strewn about! What great results you got from this interesting combination of art tools….quite unique. I like the way the colors blended and how the red added a subtle vibrancy to the lively drawings. Spring! It’s so nice to see your garden online – I’m definitely coming over soon to experience the real thing. Very nice work. I love the little spots of magenta – not too much, a hint, a tease – just like spring. I see some flowering bulbs there, watching the re-birthing of your pots. Why do I sense you have a green thumb and a wonderful eye for putting a garden together? Could you pop over my way? Left to my own devices my terrace is never going to be Home Beautiful 😦 I always expect everything to flower forever! 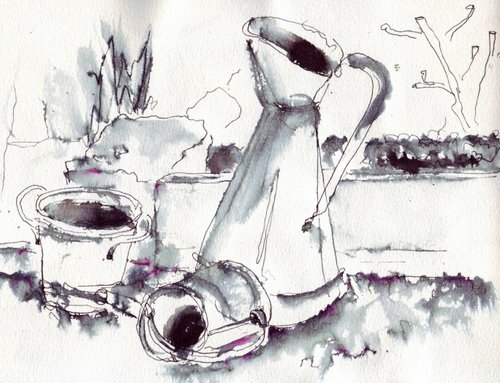 I love the monotone flavour of these sketches, Ronell full of promise of the colour to come. Also very impressed that you still had energy to paint after a day in the garden! I think these show that you were relaxed when you did them. They are such free and loose drawings. I really like the addition of the red pen. Your garden looks idylic with all those bits and bobs around it. Would like to seat there… so nice. Great wash. Above all, you got good taste. I check out your site often…really enjoy your style and subject matter. This is just lovely and the addition of the red adds just the right touch. I can feel the serenity of the day in your drawings. Wonderful. Love your quick sketches. The rotring artpen is perfect for washes. Hi Ronell! Sorry I haven’t been in touch for a while, but I am so busy lately I can’t visit blogs or if I do I cannot leave comments, you know. I love all the latest sketches you’ve been doing. 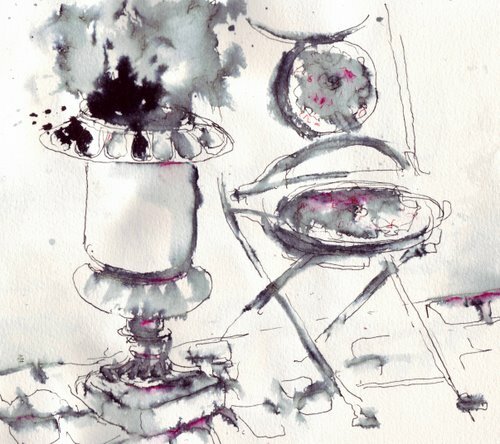 I always admire the quick sketching and how you handle watercolours or ink. Best wishes & hugs. Love those sketches but the onion and garlic is really my most favorite. How beautiful and elegant. Oh Ronell, these are wonderful. That red is just the perfect touch. I love your style. So delicate! These are wonderful – makes me want to get out into my garden. The two tone make them feel so quiet Ronell, like a precious moment stolen from time. 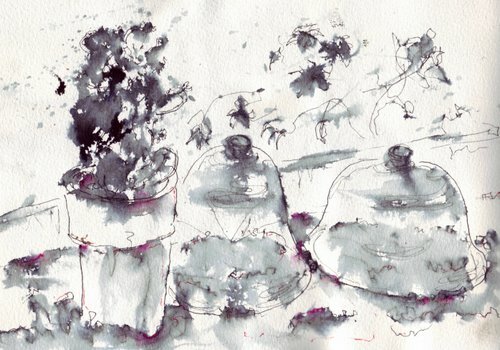 These sketches of your garden are wonderful…..and a lovely expression and tribute to the onset of Spring! These are SO beautiful. The whole set. I love the wash with that little hint of violet. Oh, gorgeous. Next Next post: Sketching a kiwi salad…with confusing creativity.